What? That might be your first thought upon reading the title. Don’t we all want to grow our businesses? Why wouldn’t I want my business to pick up? 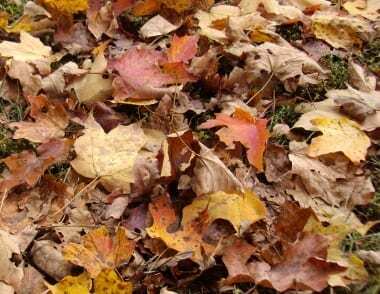 But when it comes to picking up yard “waste,” it makes more sense to leave the leaves to return to the soil. Mulch mowing is an easy way to do this, but, like me, you may have encountered challenges to successfully mulch-mow while maintaining the look clients have come to expect. Following a lot of trial and error, I’ve come up with a winning approach. Leaves were the cause of autumn panic until I came up with a combination of equipment and know-how that let me manage leaves while saving time and money. After 15 years in the landscape business, I took a hard look at how my practices were affecting the land, but I struggled with Mother Nature’s bounty of leaves each autumn. Instead of taking a dispersed volume of material and gathering it together to make a pile that then has to be removed and disposed of, I starting wondering if I could take the dispersed volume of leaves, make the leaf pieces smaller and disperse them further, until they “disappeared.” Would that harm the lawns I was trusted to care for? Would my properties look messy? If I left all those leaves essentially in place, what would that look like? Where would the leaves go, would they simply blow about? I found answers to my initial questions while walking in the woods in September 2003, and I realized there was no familiar crunching beneath my feet. I looked down and saw nothing but black beady soil. It was September, and the prior fall’s leaves were virtually gone. Of course, I know that leaves break down, but I never took the time to watch it occur. It had been wet that year, the soil biology must have been very active, and all those leaves from the previous fall were digested. What if I could do the same thing on my properties? Make the leaves disappear and have wonderful black, beady soil in their place? Before my epiphany in the woods, I had tried mowing over my leaves the prior couple of seasons, an endeavor that resulted in messy leaves cut in half or thirds and even more difficult to blow-n-clean. Now I had a new question to answer: How could I chop or mince those leaves up enough so that I could make them disappear like the leaves in the woods? My next step was to purchase a mulching kit for my ride-on Kubota 54”mower which when combined with the Gator Blades I had been experimenting with looked very promising. The mulching kit and Gator Blade combination was a solution for my larger flat properties when the leaves weren’t too deep, but I was only 30% of the way to a total solution. When the leaves became too deep or I had piles of leaves, it was tricky to be efficient with that machine. For the properties with terrain that wouldn’t allow for the use of a ride-on mower (ZTR), I had to improve the performance mulching of my 52” walk-behind machines. A combination of mulching blades and mulching kit added to your mower is all you need to get started. I experimented with different blades on my walk-behind mower, both with and without a catcher. The results were good, but it wasn’t efficient enough. I had been recording the time I spent on each of my properties using this “new” way versus the old way of blow and gather. I thought that if I could keep the leaves under the mower deck of my walk-behind mower a little longer and still have good mobility, then the one-two combination of my ride on mower and large walk behind would be my answer. I had come up with an idea for how I could modify my large commercial walk-behind mower and solve my mulching problem. Over the next two winters and the off season between 2004 and 2006, I promised myself I would figure out how to manufacture my idea; however, after a couple of months I’d forget my goal and I’d be back to work in the landscape. Then, in the winter of 2006-07, I came across something in a trade magazine that looked a lot like what I was going to manufacture, but at 280 bucks, I was too cheap to take the plunge. That changed in September of 2008 when I felt the autumn panic setting in. I decided to spend the money. This new device, the Vulcher Safety Mulcher, when combined with my Gator Blades on the commercial walk behind mower, was my mulching miracle realized! That said, I did not have overnight success; there is a learning curve. I continued to take copious notes on my time spent on properties over the seasons and made annual observations, gaining confidence over time that my mulching technique wasn’t detrimental to my properties. I learned how quickly the different leaf types took to break down into and become part of the soil. Equipped with Gator Blades and Vulcher Safety Mulcher, my mower turns leaves into tiny fragments. Here’s the kicker, I never told my clients what I was doing. I gradually developed the process on the easiest properties first, and then as I gained confidence I made strides on the more difficult properties, mulching more each season to see if I would hit a threshold as to how many leaves the property could absorb. Properties are different and have different ratios of tree and leaf load to lawn space and ground cover or beds. If mulch moving resulted in more leaf material than the lawns could hide between the upright blades of grass, I needed to move any excess quickly with a blower and lose the confetti-like remnants. Finely mulched leaves make a nice looking mulch for planting beds. The technique came full circle as my knowledge grew. Today I can walk onto virtually any property and unless it has only a pool, patio, and hard surfaces, with no lawn or planting beds and an array of large trees about the perimeter, I can cleverly process the leaves into a desirable material that doesn’t compromise the lawns, looks great as a late fall/winter mulch refresher, and carries with it all the benefits for the soil from nutrient gain to erosion control. Clients Love To Pay For It! My clients don’t mind paying for me to mulch their leaves. Why? Because in my case, it doesn’t cost them more. Gone are the “disposal costs” which I used to pass through on my monthly billing. I don’t haul stuff away anymore; everything stays on the property – the most ecological approach. Perhaps it’s social guilt or a genuine interest to do the right thing, but the demand in the area I service is growing exponentially as the word has gotten out. Financial improvement. 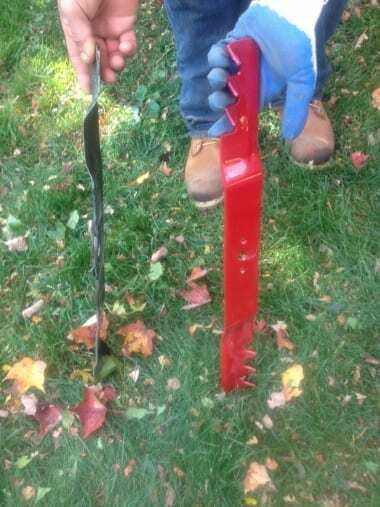 As a property manager, you can gain efficiencies in on-site labor, autumn season preparation time, disposal costs, transport time, equipment costs and more once you properly configure your existing mower equipment with mulching blades, install the proper mulching kit, and gain the skill. Soil benefit. By rediscovering The Law of Return and employing mulch mowing in your land care practice, you’ll be feeding the organisms that help make your soil rich. Instead of breaking the natural soil nutrient cycle, you’ll be working in concert with it. Changing client perspective and doing the right thing. In my experience, as long as I maintain a cared-for appearance, my clients want to do the green thing. In the end, it saves them money while making my business more profitable! That message travels by word of mouth and brings me pre-qualifiedclients. My story doesn’t end there. The word has indeed gotten out – that’s the other part of the story. In 2008, the village I live in, like many others, felt deep financial pain as the recession took hold. The timing was terrible; already deeply in debt the village had done little planning for managing garden “waste.” We were inundated with leaves that autumn, and word got out that no one was watching the farm. Landscape companies from the surrounding areas imported leaves to my village, and a mini mountain of leaves grew at our DWP facility. The village was nearly broke and now had pay for the disposal of all the leaves. Seemingly bad timing, turned out to be perfect timing because I had an answer. But would anyone listen? My village was slow to understand and take interest in the advantages of leaf mulching despite my regular attendance and presentation at Village Meetings and my explanation of a solution that would save the budget thousands of dollars. Finally I caught the attention of a friend who was active on a Green Policy Task Force in a neighboring village, Irvington. I was asked to speak with residents of that village and to tell my story. They took careful notes and peppered me with questions. I had finally found folks who might listen. Instead of hauling large quantities of leaves from place to place, properly mulched leaves take up little space and decompose quickly. 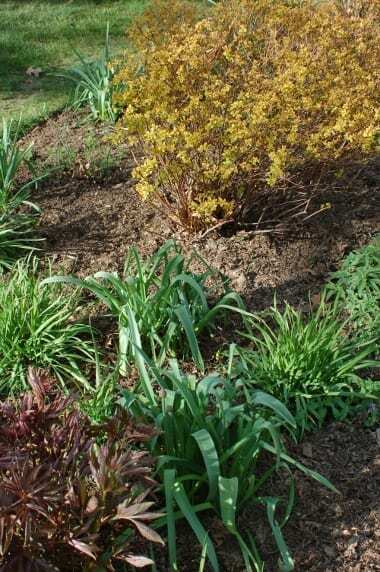 As a result of my persistence, in 2010 the village of Irvington adopted a resolution to support and promote the practice of mulching on town property. From there other villages fell in line like dominoes as our education roadshow got under way. Politicians and others never pass up something that makes them look good. From Irvington, the concept has spread throughout Westchester County, NY, as a partial solution to budget problems. 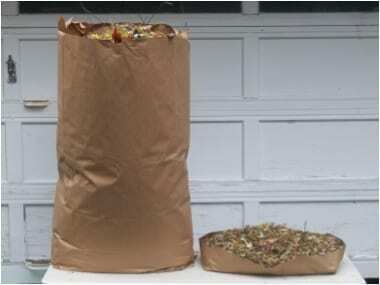 In Westchester alone, various municipalities may spend over $600,000 on the annual circus called “leaf collection.” The potential saving to Westchester County alone is conservatively estimated at over $4 million annually, but after calculating all of the collective annual costs associated with leaf pickup and removal, that number is possibly greater than $10 million. In addition to cost savings, people are seeing improvement to the quality of life in neighborhoods as we begin to quiet things some by a reduction in the usage of howling blowers and working with nature and mulch mowing. As laws restricting blowers pop up in more and more communities around the country, in Westchester County, we’ve already have adapted to life with very limited use of that annoying tool. By aligning Nature’s principles and your landscape care practices and, to borrow a saying, “working with power over force,” you can transform the way you conduct your work and business. Proper mulch mowing does all that. As autumn arrives this year, seriously consider utilizing mulch mowing for your autumn leaf management. All that is initially required is for your existing fleet of commercial mowers to be modified with Gator blades and a versatile, easy to install on/off safety mulching kit. (I prefer the Vulcher.) The initial investment is minimal – and the tools last for many, many seasons and the cost is negligible compared to traditional vacuums or other leaf “cleanup” equipment. Individual homeowners or others using rotary mowers can make adaptations, too; it just takes longer to achieve the desired results. Once you have the equipment, the only thing that takes time is gaining the confidence to use these techniques on every property. But don’t let that stop you. Begin small and as you gain confidence, expand on your success. 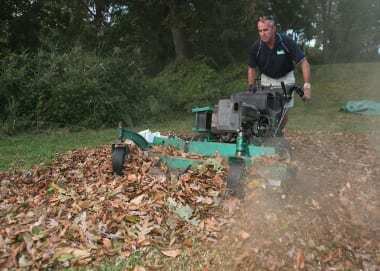 Most landscape companies, at least here in southern New York, gauge the number of accounts they can service by how they can handle the fall “cleanups.” Now, instead of fearing Autumn and all those leaves, companies I’ve taught to adopt autumn Mulch Mowing of leaves chuckle at the thought of fall. Many have sold their vacuums, cut disposal costs by 70% or more, and seen their efficiency and profitability soar. By making a few adaptations to my equipment and experimenting a bit, I’ve updated an old way doing things and found a modern, efficient approach to managing autumn’s bounty of leaves. By mulch mowing, I’m returning a valuable resource back to the land I care for and slashing wasteful costs while profitability soars.. I hope you’ll stop “picking up” leaves and instead Leave Leaves To Mulch! Tim Downey is President of Aesthetic Landscape Care Inc. in Hastings on Hudson, NY. In 2000, , Tim attended The Green Gorilla Course with Jeff Franks that changed his view of landscape practices.ecame NOFA certified. Tim has been mulching leaves since 2000 and encouraging others to do the same. Tim may be reached at TDowney520@Optonline.net. Some materials were created by folks new to the process. If something feels out of place, feel free to contact Tim for clarification.